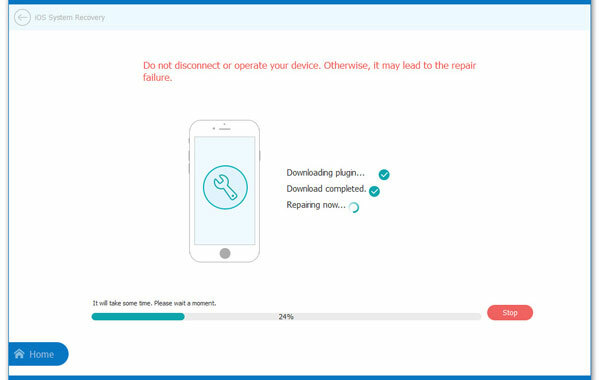 Recovery Mode is a popular Apple device restoration service that provides you with an easier yet secure way to fix various iOS system issues. This restoration service is characterized by a distinct iTunes logo that requests you to connect your iOS device to your PC. You should never confuse Recovery mode with Device Firmware Update (DFU) mode as the DFU iOS system restoration option is more comprehensive. DFU mode allows you to select any firmware of your choice for iOS upgrading or downgrading purposes. Recovery mode, on the other hand, can only be used to restore your iDevice through installing the latest iOS firmware. Your iPhone, iPad or iPod Touch might get stuck in recovery mode due to various reasons. - Update your iDevice to the latest iOS when it has a low battery. So, if your iPhone stuck into Recovery mode or you wish to fix it, just follow the below tips at once. Part 1. How to Exit Recovery Mode Manually? Part 2. How to Use iTunes to Fix Recovery Mode Issue? Part 4. How to Fix an iPhone Stuck in Recovery Mode with TinyUmbrella? This method may or may not work on your iOS device depending on what caused your iPad, iPhone or iPod to get stuck in Recovery Mode in the first place. However, it does not hurt to try it before proceeding to the other sophisticated methods provided in this comprehensive guide. Below are the simple steps you can use to manually exit Recovery mode. - Connect your iPhone, iPad or iPod touch to the computer with USB cable, then gently hold down both the "Power" and "Sleep" buttons for about 10 seconds. - Release both buttons immediately when your iDevice restarts. Your iPhone, iPad or iPod touch will now hopefully restart in normal mode. Kindly proceed to the next tutorial section if you were unsuccessful. How to Fix Recovery Mode Stuck Issue with iTunes? iTunes, apart from helping you to store and sync your private data across multiple Apple devices can also be used to fix iOS Recovery mode. Carrying out an iTunes restore is considered to be the standard and most common method for restoring any iOS device that is stuck in Recovery mode. Below are the simple steps to fix iOS Recovery mode using iTunes Restore. Step 1. Download and install the latest version of iTunes on your Windows PC (Mac users can ignore the download process and simply update iTunes on their computer). Then, launch it. Step 2. Connect your iDevice to your computer and then gently hold its "Home" button until you are provided with a pop-up message informing you that your gadget needs to be restored as it is currently in "Recovery Mode." Step 3. Select your connected iOS device and then proceed to click on the "Summary" iTunes option. 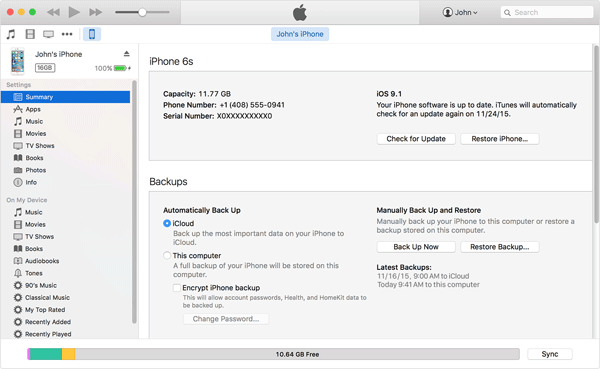 Click on the "Restore" option and then follow the on-screen prompts provided to backup your iOS gadget's settings. Step 4. You can now select the iTunes "Restore from Backup" option, choose the relevant backup file and then restore your device to fix iOS Recovery Mode. Read Also: How to Extract iPhone Data to "Fix Stuck in Recovery Mode"? How Can I Exit Recovery Mode with 3rd-party Tool? There are various third-party iOS recovery programs that can be used to fix iOS Recovery Mode. However, this final tutorial section will only focus entirely on showing you how to use the iOS System Recovery application to fix iOS Recovery Mode. Despite being primarily designed to perform local restores for iDevices, the tool also can be used to fix almost all kinds of iOS Recovery issues. 1) Connect iPhone, iPad or iPod touch to the computer with USB cable, then launch the program and enter "More Tools" section. Select "iOS System Recovery" in the screen. 2) Hit "Start" in the interface, and you'll need to enter DFU mode. Then download the marching firmware package to the latest iOS system by clicking "Download" button. 3) When the downloading process is finished, the program will start repairing your iPhone system issue automatically. This process may cost for a few minutes. Now, your iDevice exit recovery mode and back to normal. How to Exit Recovery Mode on iPhone/iPad with TinyUmbrella? Umbrella - save SHSH file of any iDevice so that users can downgrade their device or restore an older firmware. TinyTss - an local server used to playback saved SHSH file during an iTunes restore. Even though TinyUmbrella is a nice program to fix your iPhone stuck issue, but there is no guarantee that you'll never lose data during the whole process. 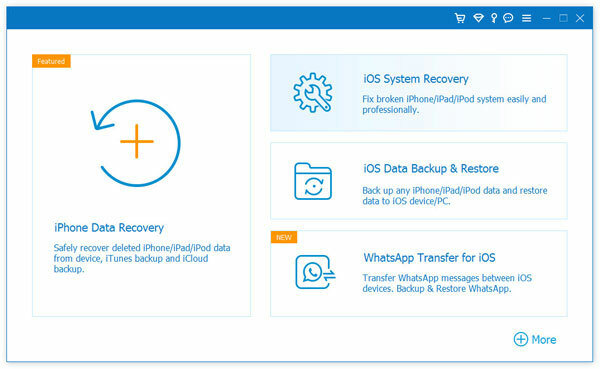 So you'd better to know how to recover deleted or lost iPhone data before using the TinyUmbrella. Now, you can follow the below steps to begin the whole process. 1. Download TinyUmbrella on your Windows or Mac computer, then connect your iPhone into the computer with USB cable. 2. Launch TinyUmbrella on your computer and it will detect your connected iPhone automatically. After that, you'll see an interface like below. 3. Click on the button of "Exit Recovery" to get your iPhone out of recovery mode. How to Fix iPod touch Stuck at White Screen of Death? How to Exit iPhone DFU Mode without Data Loss? How to Back up iPhone in DFU Mode? Alternative to TinyUmbrella: How to Exit Recovery Mode on iPhone/iPad? iPad White Screen of Death? 3 Ways Show You How to Fix It! iPod touch Stuck in Recovery Mode? Best Solution to Fix It! iPhone Stuck into White Screen, How to Fix it? How to Solve iPhone Notes Icon Missing or Hidden Issue? How to Downgrade Your iDevice with TinyUmbrella?